With the 2017 Geminid meteor shower peaking this evening, I put together a list of 10 things to think about before you head out into the cold, dark night to enjoy the show. Whether you’re an old pro or a complete rookie at photographing meteor showers, it never hurts to review just to make sure you are at the top of your game. Everything I discuss below is covered in this informative 20-minute video so you have the choice: read or watch. Or, better yet, do both. 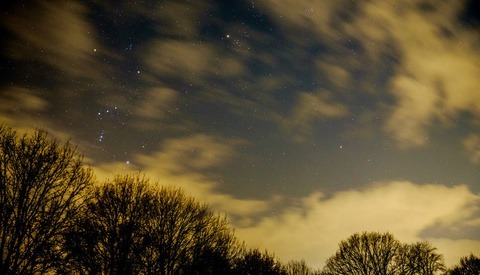 First and foremost, you should plan to go where there is as little light pollution as possible. Meteors are pretty faint and so getting away from those bright street lights can make a world of difference in how many you capture. As with any landscape or nightscape photograph, you should also choose an interesting foreground. Look for good leading lines to draw your viewer into the shot. Or, an interesting landform with meteors above it is always a good way to go. How can you tell if the meteors will be above where you’re shooting? You’ll need to know when the constellation of Gemini rises and what its path across the sky will be. Geminid meteors will all appear to come from that point in the sky, called the radiant (more on this later). Make sure to check the weather forecast for where you plan to shoot. Most likely you’ll be out in the elements for a while and there’s a good chance it’ll be chilly. Dress in layers, bring a hat, and definitely wear gloves. Don’t forget to bring along some hot chocolate or coffee to warm up while you’re out in the cold. There’s nothing worse than to spend an evening shooting meteors to find out that your tripod moved on you during the night. To capture viable frames that can later be processed properly, it is important that your camera stays very still. This begins with having a sturdy tripod. I use, and love, Gitzo Mountaineer carbon fiber tripods with Really Right Stuff ballheads. When you set up, make sure that your tripod is on solid ground and that it is weighted down, if necessary, to keep it from being jostled by the wind. Have you ever taken your memory card out of your camera to download the images onto your computer only to forget to put it back when you are done? If you haven’t, you will. And, memory cards have a knack for dying right when you’re shooting. The takeaway here is to keep a spare memory card in your gear back or glovebox in your car. Also, a little organization can help. B&H Photo sells really nice color-coded memory card holders. I use a red one for memory cards that need to be transferred to my computer and a green one for memory cards that I know are ready to use. Just like memory cards, batteries have a way of biting the dust at the least opportune time. Even if the worst doesn’t happen, they will still lose their charge if you don’t tend to them. This is especially true when it is cold outside. Be sure to top off all of the batteries you will need and also store them in a warm spot. I have seen photographers use electric lunchboxes to keep batteries warm or you can go the low-tech route and put them under your armpit (yes, I have seen someone do this). What is an intervalometer? Very simply, it is a device that plugs into your camera to control how often, how long, and how many shots get taken over a set amount of time. This allows you to set up the parameters and let the camera go to work. Many modern cameras come with a built-in intervalometer that should work fine for putting your rig on autopilot for the night while you scan the skies. That said, there are some nice external intervalometers that offer additional features over what your camera likely has built-in. I have tried a few of these and my favorite is the Pluto Trigger. It has a good battery life, it is rechargeable via micro-USB, and it has an app (iOS and Android) with some cool capabilities. Vello also makes an excellent wireless intervalometer that works well with many camera brands. For starters, you’ll need a camera that allows you to manually control the shutter speed, aperture, and ISO. You will also want to use a wide, fast lens. Something around 24mm is a good starting point with 14mm being even better. Keep in mind, even though meteors emanate from the radiant (coming up… I promise), they will appear in broad areas of the sky. The wider the lens, the better chance you have of capturing meteors in your field of view. As for speed, the faster you can go, the better. I like f/2.8 or faster but you can get by with a lens in the f/4 range. Not only are meteors spread out all over the sky but they are also faint and fast. The goal is to set up your camera to match the speed and brightness of typical meteors. Obviously, the settings on your camera are going to vary depending on the optics you have available but as a ballpark starting point, I would suggest an aperture of f/2.8, shutter speed of 30-seconds, and an ISO of at least 1,600. Turn off autofocus as you’ll want to set it to infinity and leave it. Also, disable long exposure noise reduction if your camera has it and it is turned on. Set the intervalometer to take an image every 33 to 35 seconds for as long as you’re comfortable hanging out under the stars. This suggestion may seem odd since your camera is leaving the shutter open for 30 seconds but it is to allow time for the image to get written to the memory card. You can adjust all of these parameters accordingly once you have a feel for how your setup is performing. 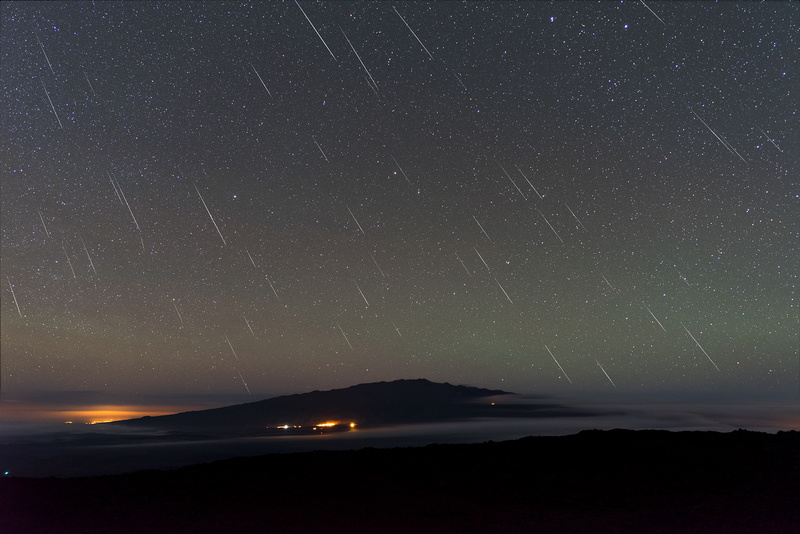 At this point, you might be wondering just how many meteors you will capture. 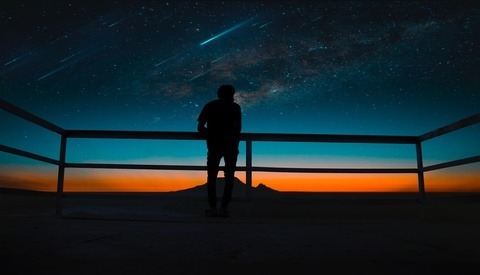 The reality is that it depends on how good the meteor showers itself is, the Geminids is typically one of the best with rates as high as 120 meteors per hour. For the Geminid meteor shower of 2015, I shot for about three hours (360 photographs) and captured about 60 meteors. In August of 2016, I photographed the Perseid meteor shower for around four hours (480 photographs) and imaged well over 100 meteors. 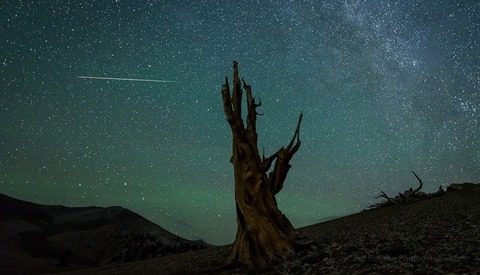 With only two data points, it’s difficult to say if the average holds over time but if we just go with those, you could expect to record a meteor on 15 to 20-percent of your photographs. All meteor showers have a radiant: a point in the sky from where the meteors will appear to radiate. For the Geminids, this is the constellation Gemini, the twins. The actual radiant point is near the star Castor. Gemini will rise in the northeast around 8 or 9 PM (local time) and will make its way overhead as the night goes on. The radiant is a moving target, which is why it is important to understand where it is throughout the evening. This will help you compose your shot so that the foreground is interesting and you have the best chance of catching some meteors. Since the radiant is moving, if you were to stack all of your images together, the meteors will appear to be going all over the place. In part two of this series, I will introduce some image processing techniques that can help you get your meteors under control. One last thought about your composition and the radiant. Some meteor shower radiants are low in the sky which allows you to do a "hyperspace" view with the meteors all leading back to the radiate. The Perseids are a good example. Gemini, on the other hand, rises fairly high in the sky so it is difficult to keep the radiant in your field of view even with a 14mm lens. This will cause the meteors to appear as though they are raining down across your composition. This is especially true for the Geminids since the best time to shoot meteors is a few hours before astronomical twilight and Gemini will be almost directly overhead after midnight. Before and after view showing the results of applying techniques to align meteors to the radiant. This will be discussed in part two of this series. Even though this is far down my list, it is one of the most important and challenging things to do when you are shooting at night. Most cameras don’t autofocus well in low-light. In fact, for nightscapes and meteor shower photographs, you should just turn off autofocus altogether and plan to manually focus. There are a few good techniques to help you reach excellent infinity focus in the dark. The primary one is to use the “Live View” mode on your camera. To begin, set your focus ring to near the infinity mark. This will give you a rough focus. Since you’re manually focusing to infinity, you can move the camera to anywhere in the sky where there is a bright star. You should be able to see it fairly well even though it may be a little fuzzy or blobby from being out of focus. Zoom into the star to a medium amount then move the focus ring in and out. The star should pop into focus and even some more faint background stars may become visible. Finally, zoom all the way into the star and move the focuser slightly in and out until the star is a tight point of light. You will now be at excellent infinity focus. If a bright star isn’t visible, see if you can use a distant car light, street light, or house light to focus on. Just be sure it is far enough away to achieve infinity focus. Finally, be creative. Spend some time when you are in the field coming up with a cool composition, an interesting leading line or S-curve, or something else that can be the foreground star of your shot. Be sure to post up your shots from the Geminid meteor shower in the comments below. I can't wait to see what you get! Every now and then a large meteor will enter the atmosphere and explode in a brilliant, but rapid, flash of light. Often times, they will be a mysterious green color. The really bright ones can light up the ground and cast shadows in the middle of the night. And, if you look really closely, they will leave a trail in the atmosphere called a train. If you are really lucky, you might even be able to photograph it like I did during the 2016 Perseid meteor shower. The video below shows my final composited image of all 100 meteors plus a time-lapse movie of the fireball and resulting colorful train.